Good morning! 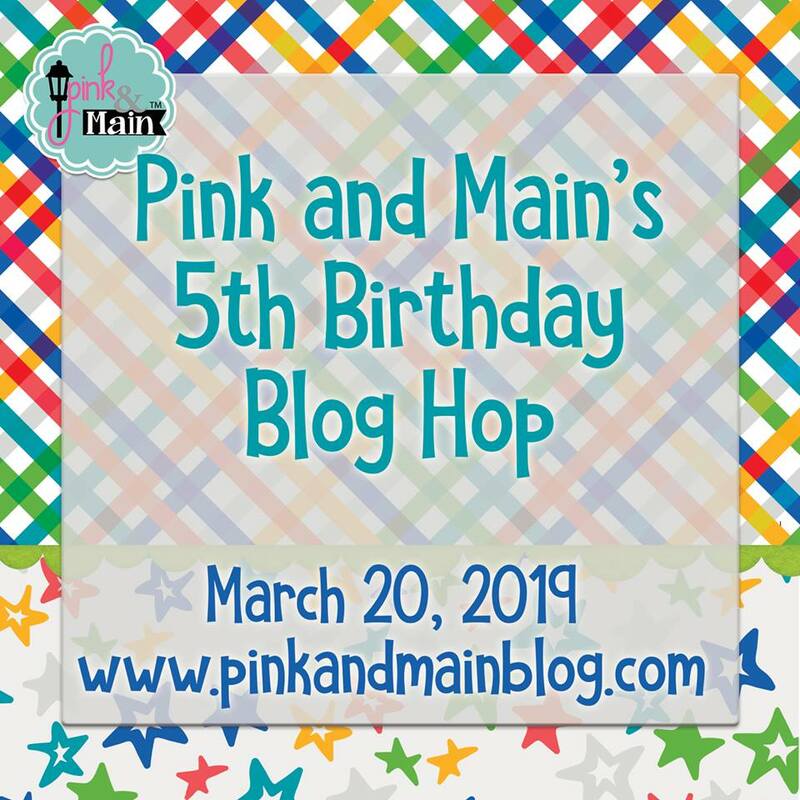 I'm excited to be celebrating Pink & Main's 5th birthday by being part of a celebratory blog hop! 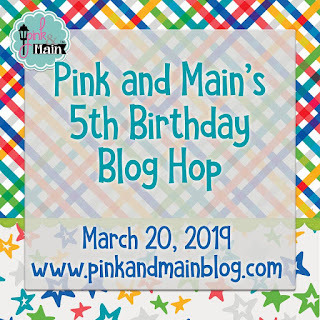 See all the blog hop info with links and prize details below! I made two 'bee-day' cards for the hop. For the first card, I stamped and masked all 3 of these bees - I couldn't choose just one of these cuties! I kept my colour scheme simple because the scene was already quite busy, and I wanted some focus for the sentiment. I used the Happy Birthday die but I trimmed the birthday, to make B day. And then I coloured the letters yellow with Copic markers, and then added a bee-like stripe. After they were glued down, I put Stickles on the letters and on the wings, for some sparkle. For my second card, I coloured and die cut the hive and then die cut a bunch of the tiny bees. To keep this card more clean and simple, I blended a strip of blue sky but left the rest of the panel white. There will be FIVE randomly-chosen winners of $50 store credit each. The winners will be chosen from comments left on posts of the blogs linked below. To qualify, you must comment on all the blogs in the hop. Cute cards! Love the release! I LOVE how you did the bee stripe on the die cut! So smart! Love the bee striped sentiment! What cute cards. Love how you did the lettering in bee colors. So adorable I love your bumble bee letters!! Both of these cards are darling! I just love the banners. This is just adorable. Both your cards are just too cute. I love how you incorporated the bee stripes on your happy birthday, such a great idea. The strip of sky is great. I like the bees and hive. Theses are so cute. It almost looks like a Christmas birthday! We get so many cute ideas from you amazing designers and fun hops. Great cards! The stripe is brilliant! Love those bees. Wonderful card. Awww...how cute are these cards! Black & yellow stripes on the die cut sentiment... aww yeah! That is a super bee-utiful idea to make the words in bee colors! It really makes the card pop! Wonderful color palette and I like how sparkly you made the Happy Bday! I like the ombre background too; makes the bees look even cuter! Love the striped sentiment. Both cards are awesome!! Both cards are so cute showing how versatile the stamp set is. Love your creative design on both cards. Nicely done. I know the bees are supposed to be the stars, but your sentiment stole the show!!! Brilliant idea! Cute cards. I like the sentiment on the first one. Love the colors of the three bees and the one bee holding the cupcake. So cute! such cute cards! I love your bee striped words! Very cute cards. I especially love the stripy sentiment in the first card. Love both cards especially the simple one. Your card designs are super nice, Ardyth! Love the black/yellow stripes on the first and the single colored stripe on the second. These bees are sooo cute! What a fun birthday card! I love your bright clean cards, very well done! Love everything you make and this is no exception!! The black stripe on the Happy Bday sentiment really ties it into the bee theme perfectly. I love how you masked the bees on the birthday card! They are so darn cute! Super cute cards! 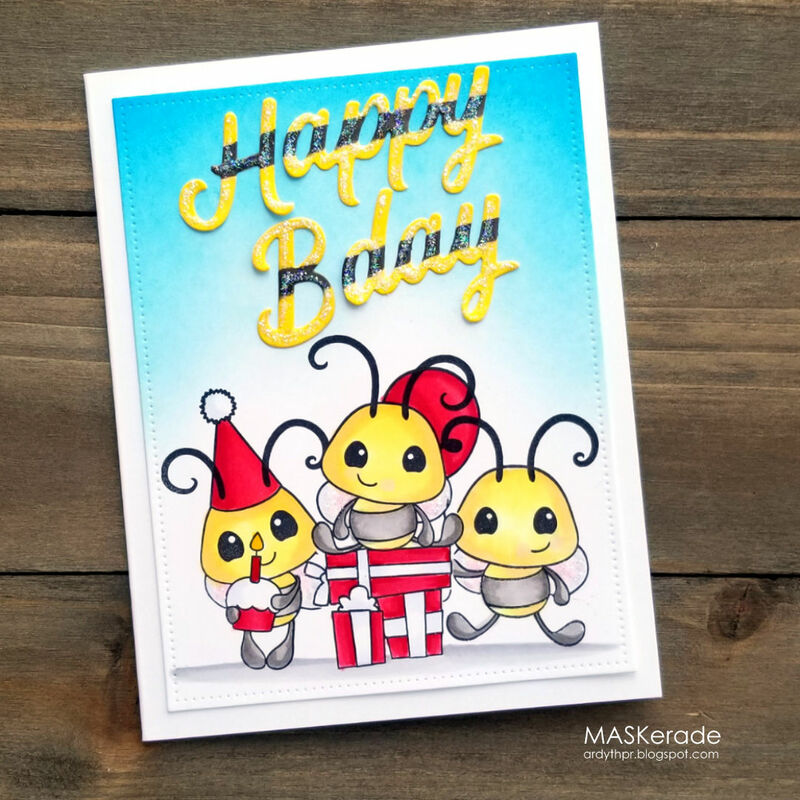 Love the bees and the fun yellow & black combo on your Happy Bday sentiment! Oh just too cute! Bright, festive and happy cards. I love the yellow and black stripes on the sentiment, so clever to tie in with the bee themed card. Your cards are adorable. I absolutely love those bees!! Such adorable cards! Love the cute bees. Such cute cards! Love the colouring. Love both your bee cards! Ardyth, this card is so bright and cute. I love the Bee images. I love both of your cards. This bee release is darling. Really cute cards, Ardyth! I love how you grouped the three bees together and the striped sentiment was brilliant. The clean design of your second card lets the focus be on the adorable bee hive and colorful banner. Your cards are too cute! Thanks for the chance to win and sharing. Your coloring is amazing!! I love both cards but the second one is my favorite. I love the multi-colored banner, nice touch!! Love the 'bee'stripe on the Happy Birthday lettering- great idea! Very fun cards- thanks for sharing! I love your happy birthday bee card. So festive and fun. Wonderful job. Thanks for sharing your creativity! This is just ADORABLE! Love the cute bee!! Both cards look great, adding a bee like stripe to die cut is clever, love it. These cards are amazing! ,my first blog hop and I am loving them all! Adorable cards!! Both are so cute, but I LOVE your first card with those wonderful bees and the red and white packages were just the right touch! I'm a Roll Tide girl, so the colors went with my Bama football team! LOVE!!! Thanks for sharing! Love the composition in both the cards. The blended BG in the second card looks amazing. Great cards!! Love the sentiment 'happy bday' with the bees. Love a punny sentiment. You've shared two lovely cards. The bees are so sweet and the bright banner on the bee hive is a cute touch.